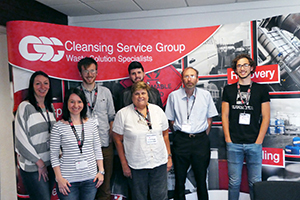 A group of staff and students from the University of Leeds were welcome visitors to CSG’s flagship hazardous waste treatment and recovery centre at Cadishead. They were on site at CSG’s invitation to observe how the company’s experts process chemical waste collected from the university’s laboratories. CSG was recently handed a two-year contract to remove and treat all hazardous chemical waste from the university’s laboratory operations. The company’s chemists now visit the university four times a year to list, label and pack the waste taken from faculties and services across the campus before transporting it to Cadishead for treatment. The university visitors toured the CSG site and met members of staff. They included students who are studying for a sustainability or environmental management degree and are compiling a project on general waste management with the university’s sustainability team.